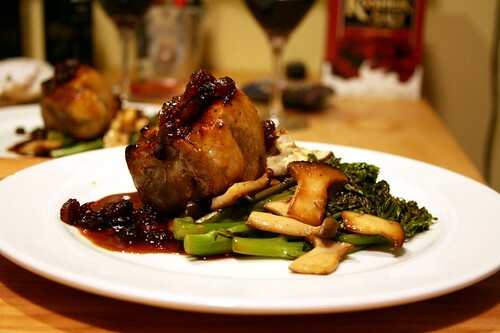 grilled pork belly with cranberry-vermouth sauce, broccoli rabe, trumpet mushrooms, and roasted potatoes, originally uploaded by aarn! +13th February, 2010+. seared off some sliced trumpet mushrooms and sauteed with some broccoli rabe. roasted up some potatoes which had been tossed in some olive oil salt and pepper. vadim made a sauce with some dried cranberries and antica vermouth (his original idea was the "pork manhattan," but he ended up with cranberries instead of cherries somehow...oh yeah, and there weren't any bitters...so that didn't work out). grilled up some pork bellies which had been previously sous vide for 4hrs or so in lard with a few sprigs of thyme and some cloves of garlic, salt and pepper. nice write-up, right? sometimes the details escape you.